All it takes to spawn a sea of happy smiles are those first few notes of “There’s a bright golden haze on the meadow,” so wonderfully trumpeted by the handsome cowboy coming down the aisle of the theatre. By the time he jumps onto the stage of cornfields and the two-storied farmhouse to give pea-shelling Aunt Eller a kiss, everyone in the audience is close to humming or joining along in full voice as he shatters the air with a glorious, “Oh what a beautiful morning.” By now we are all convinced this Curly is A-OK and will proudly fill the boots as hero in one of America’s best-loved musicals. We can now sit back in our seats, tap our toes, and sway our shoulders, confident that Broadway by the Bay is opening yet another of their blockbuster successes with an Oklahoma guaranteed to do Richard Rodgers (music) and Oscar Hammerstein II (book and lyrics) proud. For my full review of this near flawless production, please link to Talkin' Broadway: http://www.talkinbroadway.com/page/regional/sanjose/sj45.html. 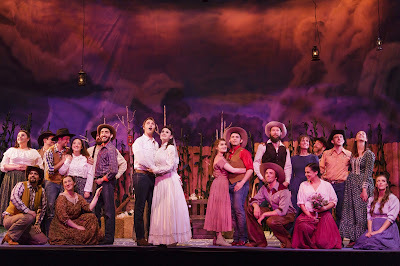 Oklahoma continues through June 19 in the Broadway by the Bay’s production at the Fox Theatre, 2215 Broadway, Redwood City. Tickets are available at https://broadwaybythebay.org/.